The Celtic captain is a signing target for Australian side Western Melbourne. Brendan Rodgers says he expects a decision from Scott Brown soon as the Celtic skipper continues to ponder a move to Australia. Western Melbourne chief Maurice Bisetto claimed last week that the A-League outfit were "pretty close" to luring a marquee signing and felt Brown would fit the bill. Rodgers has always said he will allow his captain to make his own mind up on the offer of a reported three-year deal awaiting him Down Under, insisting he would put the 33-year-old under no pressure to stay put at Parkhead if he felt a move would be better for him and his family. The pair held talks this week and Rodgers - speaking after his side kicked off their William Hill Scottish Cup defence with a 3-0 win over Airdrie - admitted he is still in the dark over which way Brown will decide. But he suggested the former Scotland midfielder was close to revealing his verdict. 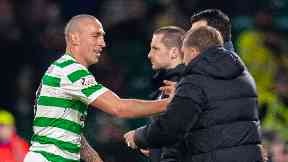 "I had a long chat with Scott in the week, which obviously will be private," said the Celtic boss. "I think he knows that some point fairly soon he'll have to make a decision, and he wants to make a decision to be fair. "There's been a lot going on for him. It's important for him in his football life that he finds that stability. "Of course he loves it here and we've given him time to make the best decision for him and his family. I'd think in the near future he'll have a decision either way. "Naturally, the respect I have for him, we want to give him that time. But I'd be very hopeful that he would be staying here." If Brown does decide to leave, his departure could leave Rodgers' side stretched in midfield for the short-term after the manager confirmed Olivier Ntcham had joined Kieran Tierney and Odsonne Edouard on the casualty list. Asked for a fitness update, the Northern Irishman said: "Kieran we'll look to get back into training around the beginning of February, hopefully. "Olivier will probably be another few weeks out I'd say. He did his hamstring the first day in Dubai. "Odsonne will hopefully be joining the group at some point next week but certainly the other two boys will be a little bit longer." While Brown's Celtic days may be coming to an end, Timothy Weah kicked off his Hoops career in the perfect manner as he put the seal on their Diamonds win with a debut strike. Scott Sinclair missed a first-half penalty but made amends with two poachers goals and Rodgers was angered by an offside call which later denied the winger a hat-trick. While on-loan Paris St Germain ace Weah - son of former World Player of the Year George - had to wait until the final 20 minutes to make his Parkhead bow, fellow January recruit Oliver Burke was thrown straight into the starting line-up and Rodgers was encouraged by his new front pair's first showings. He said: "I was really pleased with Oliver. He's got incredible talent. "Obviously he didn't get his goal but his movement created the third for Timothy. He's 18 years of age and has now scored on his debut here, which is great. "I feel for Scotty as the (offside goal) is an easy decision. The linesman, bless him, he's in a really good position and those are the ones you've got to see. It's obviously cost Scotty a hat-trick." Airdrie boss Ian Murray said: "I felt we competed very well. Overall I have no complaints with the scoreline or my team's performance."